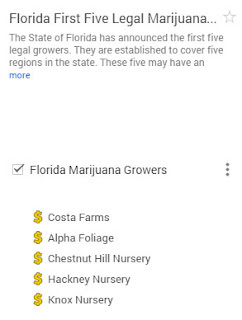 Florida marijuana growers took a big step - The State of Florida has announced the first five legal growers. They are established to cover five regions in the state. The closest growhouse to Tampa will be Knox Nursery in lovely Winter Garden where they have an "[e]xpansive selection of flowers, vegetables, shrubbery & home landscaping essentials."